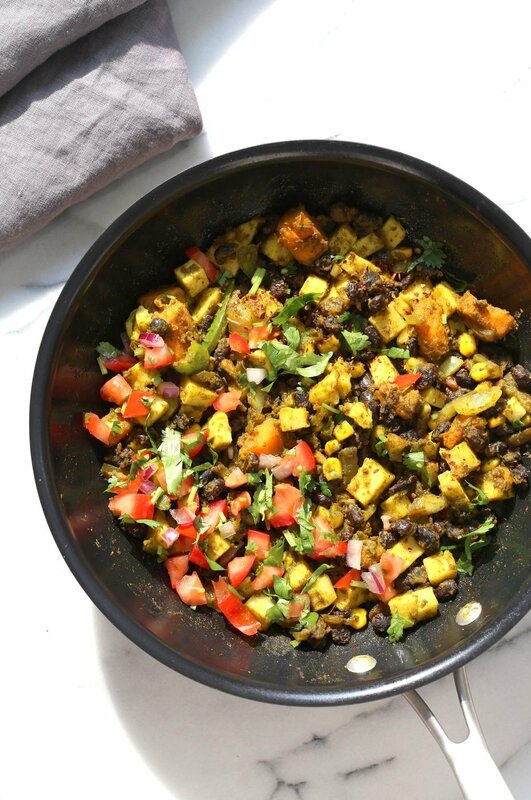 Chickpea tofu, Black Beans, Sweet Potato, Taco Spice blend, whats not to like in this scramble to start the day! This Scramble is satisfying, filling and flavorful. 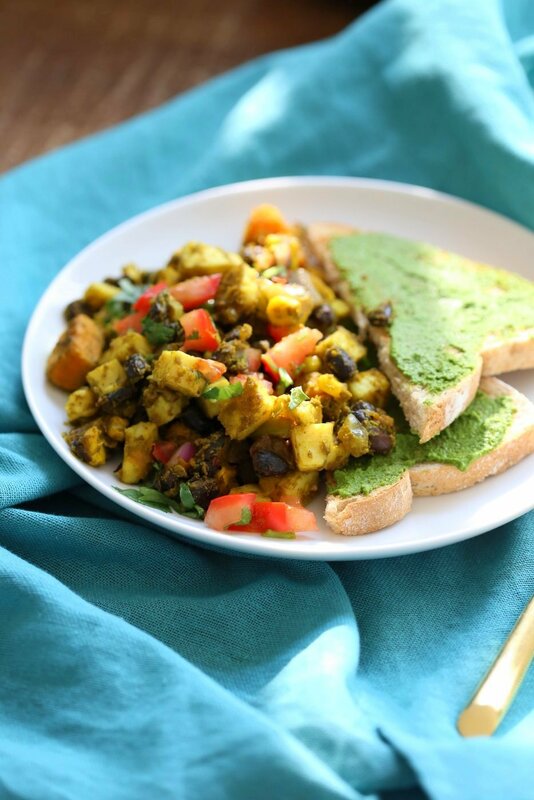 Make the chickpea tofu ahead of time for a quick stir fry into the scramble. Serve the scramble with toasts or as is. I usually use chimichurri on the toasts instead of butter. Avocado toast is also a great option. The scramble is soy-free and nut-free. Serve over gluten-free bread or gluten-free wraps. Use other veggies of choice. The scramble comes together in 20 minutes. If you make this scramble, let me know in the comments how it turned out! Please also rate the recipe. In the meanwhile, if you havent already, Pre-order my book shipping now for amazing allergy friendly Meals and desserts. Get the Bonus Bundle here. Southwestern Tofu Scramble with Chickpea Tofu. Scrambled Tofu without Soy tofu! 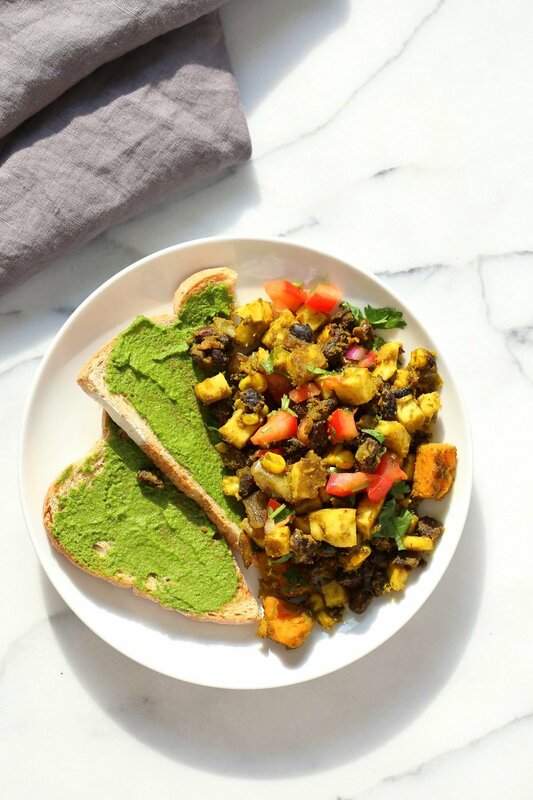 Soy-free Breakfast Scramble with Black beans, Veggies, Sweet Potatoes, Spices, Chickpea flour Tofu. Double Protein Savory Vegan Breakfast. Gluten-free Soy-free Nut-free. 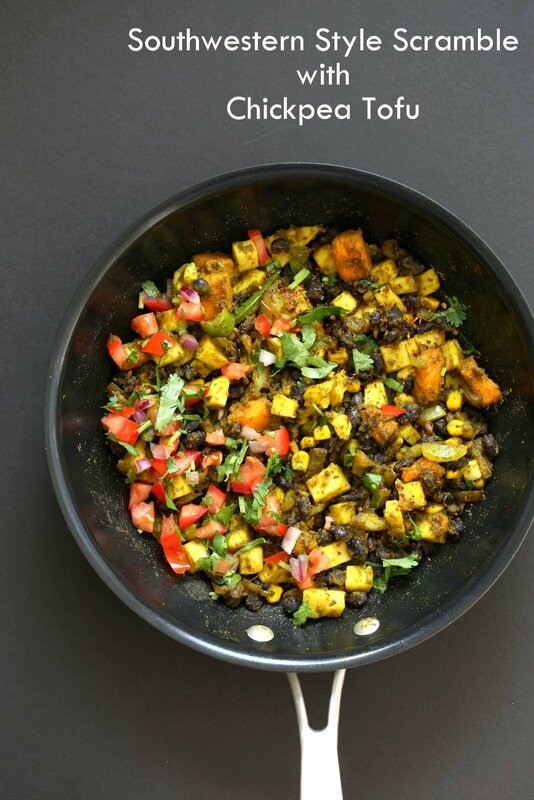 Make the Chickpea flour tofu, cube and set aside. If using regular firm tofu, press between paper towels for 5 minutes, then cube and set aside. Heat oil in a skillet over medium heat. Add garlic, onion and a pinch of salt. Cook for 3 minutes. Add the peppers, corn and other veggies if using such as zucchini, mushrooms, broccoli (chopped small) and cook for 2 minutes. Add the sweet potatoes. If using raw, add a 1/4 cup water, cover and cook for 6 to 8 minutes or until tender. If using cooked, mix in for a few seconds. I prefer to use cooked sweet potato. Add beans, spices, salt and mix in. Add cubed or crumbled chickpea tofu and mix well. Cover and cook for 3 to 5 minutes. Taste and adjust salt and spice with additional paprika for smokier, oregano or parsley, salt etc. Add 1/8 tsp kala namak (Indian sulphur salt) for eggier flavor. Add in some lemon and mix in. Garnish with chopped tomato, onion and cilantro and serve over toasts or a wrap. I usually like these with chimichurri toasts. Variation: add a tbsp of chimichurri sauce to the scramble with the beans and mix in. Nutrition is 1 of 4 serves, does not include toast. « PRE-ORDER Bonus Bundle is Here! Oh, this looks so good! I could definitely have two servings of this recipe for a really healthy brunch, breakfast, lunch, dinner, anything! Maybe even three! LOL! I just pre-ordered your book. How do I get the bonus pack. I have the order number from Amazon, but do I have to fill out a form to accompany it? I can hardly wait to get the book!!!! Looks so delicious Richa.. Preotein packed meal. You are the best! You have turn me into a hero to my family with your delicious recipes. Many more successes for you! Start with 7 to 8 oz pressed and cubed, then add more if needed. Depends on your preference of balance of tofu to beans.